In many parts of the country, winter means cold temperatures, snow and ice. Road and walkway conditions can quickly become treacherous, and travelers must take care to stay safe. It is also incumbent upon business owner to do their best to provide customers with clear, dry pathways – inside their location and out. When wet, slippery winter weather causes a person to slip and fall, businesses may be held liable for injuries sustained as a result. What Are the Business Owners’ Duties? Generally, business owners are not responsible for maintaining city-owned sidewalks or streets outside their business. However, they are required to mind any parking lots or walkways they own, as well as the surfaces inside the business. If a person suffers injuries as a result of fall on icy concrete or wet floors, the business may be held responsible and forced to pay for medical bills, lost wages and other damages. Seek medical attention. See a doctor for any injuries, even ones that may seem minor. On rare occasions, minor injuries can develop into more serious complications. Record the names and contact information of any witnesses. It may be difficult to track those who saw the slip and fall after the fact. Write down names and information of those nearby, including any business employees who witnessed the accident. Take pictures. If possible, take photos of the area to offer a visual representation of how the accident occurred and what dangers existed. Write down your own statement. Writing down what you experienced immediately after it happens while it is still fresh in your mind will help preserve important details. Report the slip and fall to the business. Make sure the business is aware of what happened. There may be an accident report to fill out. Contact a Delaware Slip and Fall Lawyer. A skilled slip and fall lawyer can assess your situation and help determine if there is cause to pursue legal action. They can also help gather and retain evidence. 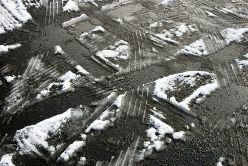 If you or someone you love suffered injuries after a wintry slip and fall in Delaware, you may be entitled to make a claim. Contact the experienced Delaware slip and fall lawyers at Morris James Personal Injury Group for a free, no-obligation consultation today.